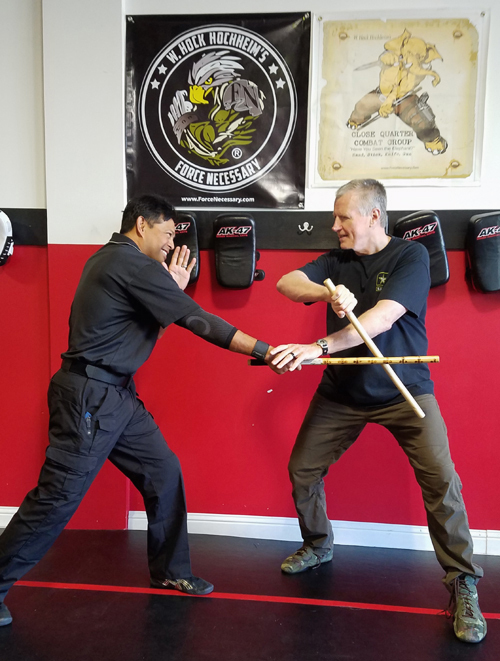 First off that’s me and the “Irreplaceable” Tim Llacuna in March, 2018’s big Central California Stick seminar weekend at Ron Esteller’s Kaju. 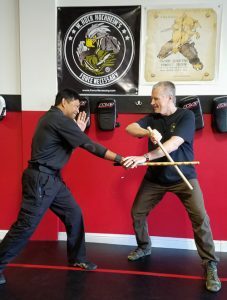 Though the Bay Area, CA seminar that weekend was listed as Force Necessary: Stick, I also promised a little segment on Filipino stick too, just to round things off. And, as a result, we got a request for…Filipino Sumbrada. And since I “sing for my supper” as Sinatra use to say, so we, by God, did us some Sumbrada. Which…can be complicated for some folks to do such things. I am not a fan of Sumbrada, per say. I certainly do not believe it should be the foundation format for a system, as it somehow is for some, which I find short-sighted. It is but one drill in a bunch of skill drills/exercises. It has been declared a “dead drill,” blah, blah, blah and yes, to some extent I agree with these naysayers. But it is still a very universal drill for many, many Filipino systems and I…in good conscious, cannot put a PAC/Filipino practitioner out on the street that doesn’t know about Sumbrada and hasn’t fooled with it. I just…can’t. I’ve been forced, more or less, to mess with it since 1986 and that is why. It does develop a few healthy attack recognitions and mannerisms. I first learned Sumbrada from Paul Vunak in the late 1980s. Sumbrada means a few things, like “counter for counter” and sort of like “shadowing.” Sumbrada range is when the tip of your stick can touch the opponent’s head and your hand can touch the opponent’s hand. That hand contact is a very deep subject. People tend to forget that on the end of all these drills, you break the pattern. Like the Bruce Lee example, folks get busy looking at the finger and not the moon, people get too busy worrying over the pattern and forget you are supposed to free-style fight. 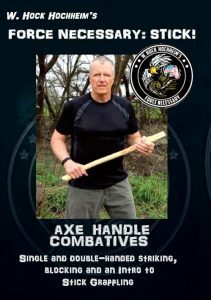 In that PAC course I require folks do hand sumbrada, single stick sumbrada, double stick sumbrada, Knife sumbrada, espada y daga sumbrada. And, we make folks do at least three inserts/interruptions for each, all in Level 7 of the PAC course. Sumbrada is just another exercise, among many exercises, which include wind sprints and chin-ups and beating tires and war posts, etc. Doing too much of one thing and not enough of other things is the real problem. Previous PostThe Ten Deadly MistakesNext PostI Was a Teenage…Teenager!